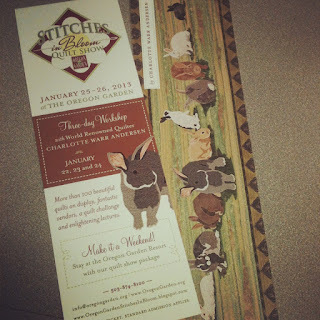 Stitches in Bloom 2014: Thank you! Thank you to all who came to the quilt show. It was bigger than ever and we can't wait to see you next year. I'll post some photos as soon as we have them! 2013 Book Mark featuring Charlotte's work! As you might have noticed, the blog has been updated to 2013 information. Workshop registration, Quilt Challenge, and Quilt Show entry forms are available on the forms page as well as information throughout the blog on next year's show. Make sure to take advantage of the 10% early registration discount for the workshop with Charlotte Warr Andersen.